I know there’s an update to ModStep in the works. Since I’m not in the beta test and I haven’t heard back from AppBC, I thought I would just post a little missive about some bugs on the off chance that someone who is in the beta can verify that they’ve been fixed, or else bring the issues to the devs’ attention. -Audio weirdness: often when I load ModStep into Audiobus 2 or AUM it seems that ModStep’s audio output isn’t actually in those apps’ channels, but rather seems to be directly connected to the device output. Starting ModStep by itself and then adding it to the apps seems to help, but even that is not consistent. Like most people I just host things in AUM now (actually Audiobus into AUM as I use State Saving and Audiobus Remote), but still it would be nice to get these issues squared away. -Exporting clips don’t seem to save their CC modulations. Notes are saved in the exported clip, but CC data seems to vanish. -Clips can't be deleted - at least there doesn’t seem to be a way other than using iFunBox and deleting from that. 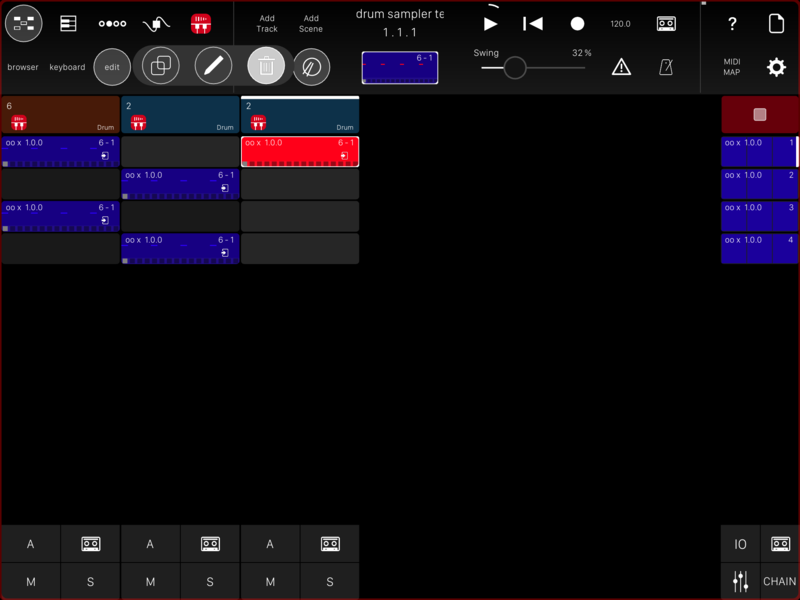 -Play state not shown in Audiobus Remote (or Audiobus side panel). In both cases the play button stays a triangle when pressed and doesn’t change to a Stop button to indicate that the app has started playing. Not a major issue, but still. Now, I do have a couple of suggestions / requests that I think would make working with ModStep even more useful. It’s probably too late to get these added if they haven’t been worked on already, but I might as well ask! -High res modulation editing. Ability to 'maximize' the 'mod' window into the area the piano roll occupies for high precision modulation drawing. It's already possible to maximize the piano roll, hiding the mod area, so it seems logical that the reverse could be possible. -Ability to enter an exact value for a node by long pressing it. Sometimes you need to hit an exact value. -Ability to generate preset curves to begin working from (Sine, Saw, etc.) with definable ranges and rates Basically an LFO that writes into the mod window. Actually, just having LFOs would be pretty cool…. -Show guide lines at values 32, 64, 96 in the small mod window. When expanded to full screen have more detail. -MIDI CC range limit applies to piano roll editor too. You can apply range limits to CC controls in the Template Editor page, but they only apply to the X/Y pads in the Step Sequencer. You should be able to toggle a setting in the Piano Roll to just have the reduced range in the mod window. e.g. some synths have buttons that respond with 0 off, >=1 on. This is very hard to draw in the Piano Roll, but if the range was limited to just 0 -1 it would be easy. -Show all CC's recorded, even if modulation isn't in the X/Y pad. If you enter some modulation for, say CC5 and then change your template to something that doesn’t have CC5, it will look like the modulation is gone. It won’t be active, but it’s still there. If you add a template with CC5, you’ll see it again. There should be a way, even with XY pads empty to see all CCs that are currently written into a clip. -Full template editor. Instead of having to add a CC number and then assign a name, it would be much quicker if the template editor opened a window with 128 fields like a spreadsheet. You would then just enter the name next the number you wanted. Much, much quicker to build out a new template. Empty fields wouldn’t show up in the palette. -MIDI CC range or switch saved in template. I know you can save a reduced range to a controller when it’s assigned to an X/Y pad, but I would prefer if you could save that reduced range in the base template itself. I don’t like to have assignments in the X/Y pads, I prefer to just add what I want per song. —Two finger cursor moves are not supported. —Bluetooth keyboards are not supported. Also, when an entry is just numeric, the keyboard should switch to just a numeric keypad instead of a full alpha keyboard. -Clip modifications. While you can set clip measures to play at different speeds it would be great if you could actually change the MIDI data. 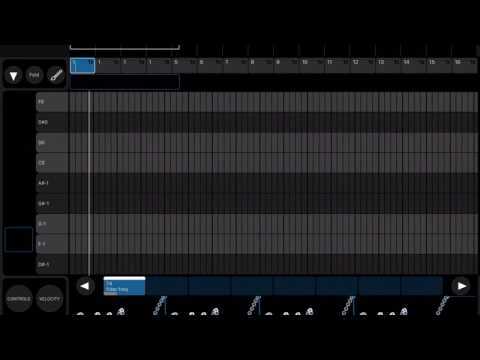 @gonekrazy3000 showed a technique for doing section chopping with the new version and AB3, but it would be great if this was just part of the editing suite. 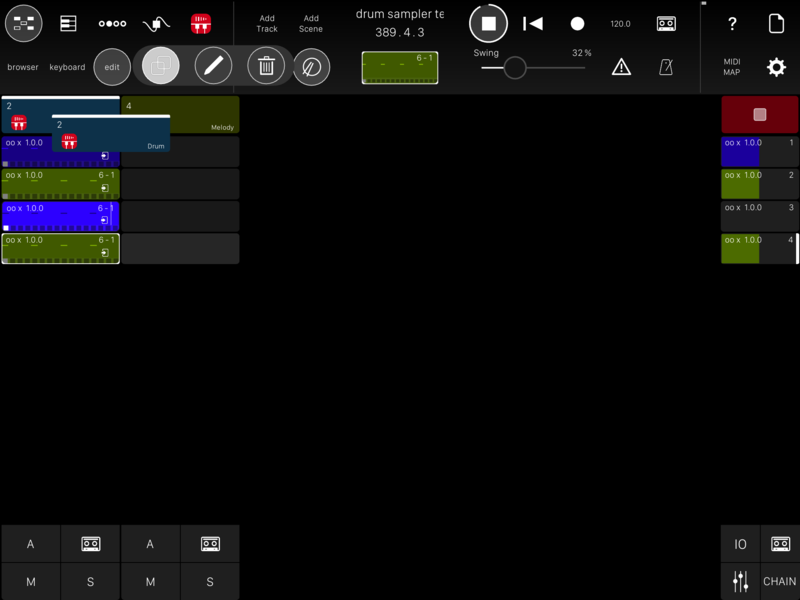 Also, the ability to reverse or invert (flip on the Y axis) a MIDI clip would be fantastic. -Activate button on finger up. This is a common paradigm for buttons in audio hardware and software. Basically, it’s more precise to set your fingers and lift up to active, say Mutes, rather than pressing down. A settings toggle to change the behavior would be great. -Other time signatures - not just Active Steps. 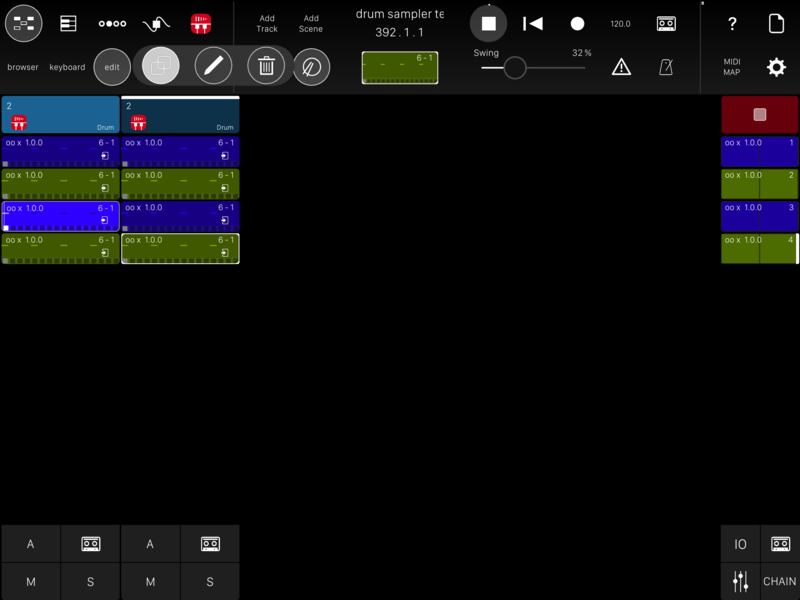 Active Steps are great, but you should be able to set a base time signature first. 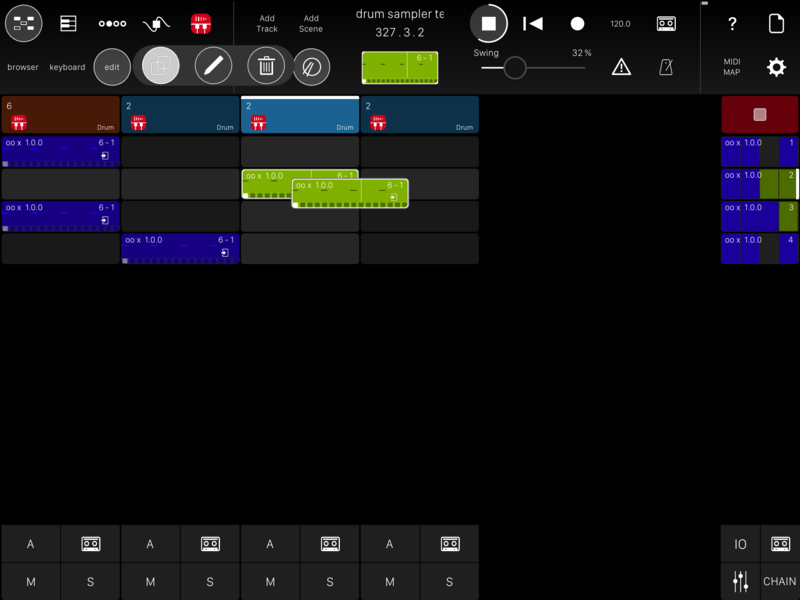 -Regarding Active Steps, they need to be much more visible in the Step Sequencer! -Regarding Step Sequencer: the ability to see chords would be great. 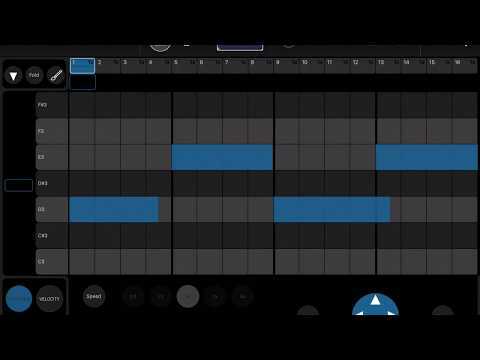 There could be a disclosure triangle like in the Piano Roll to expand the size of the note area. 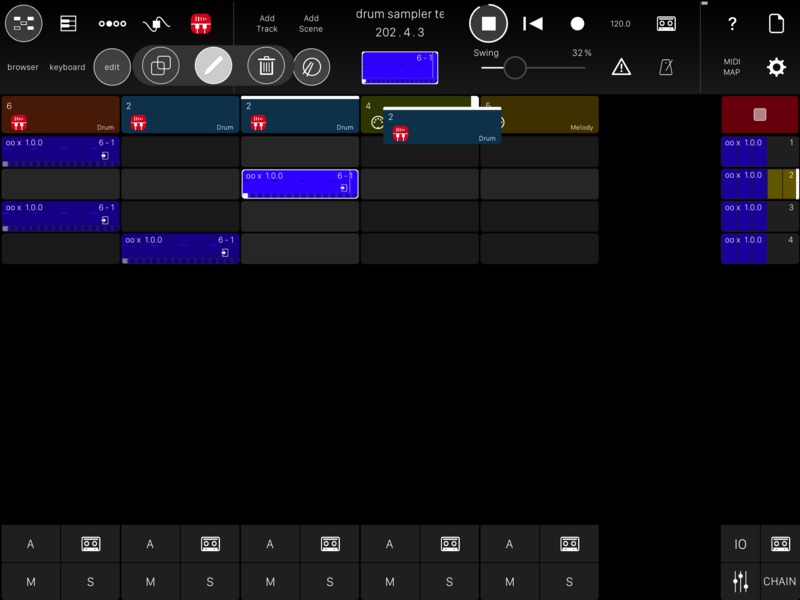 -Audiobus Remote. More controls visible through AB Remote: scene triggers, possibly channel mutes. -Ableton Export of MIDI. I know that early versions of Ableton Live Set Export were limited in MIDI export, not sure if that’s changed, but getting a Session out to Ableton would be amazing! By clips do you mean audio ? The delete tool is context sensitive and can delete anything. Midi, audio folders,cells,layers, midi inside a bar in the step sequencer... doesn't matter. It's the garbage icon in the edit menu. You double tap to delete. It only deletes one item at a time though. Regarding audio wierdness I wouldn't know since I only host in AUM. 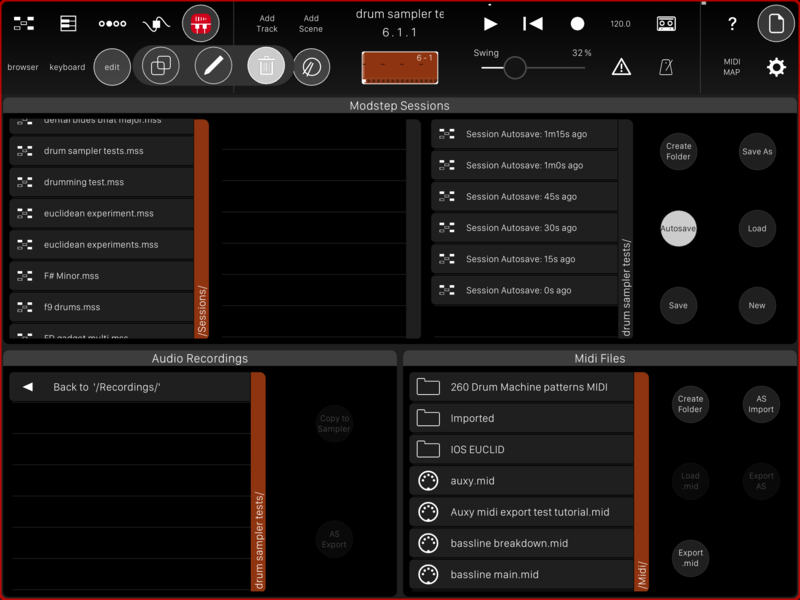 I don't even use Audiobus 3 for audio. Aum is just better. 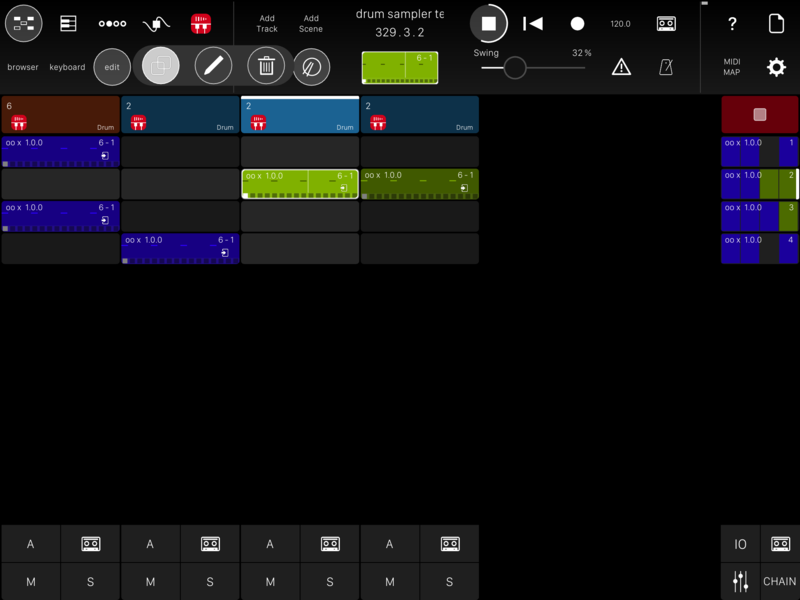 Also, that section chopping I did works just as easily using midiflow adapter. You just send the first track to midiflow adapter port 1 and in audiobus you send the adapter to itself. 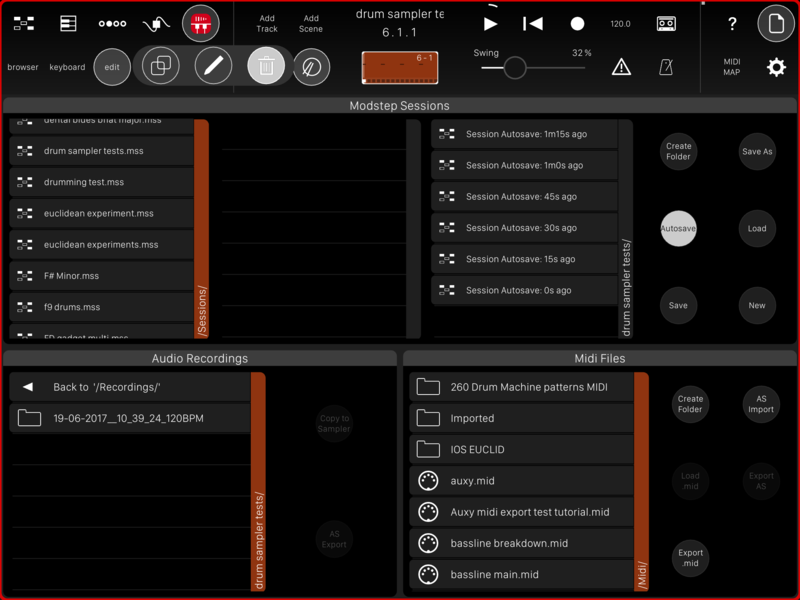 Set input for next track inside modstep as midiflow port 2. By clips do you mean audio ? The delete tool can delete anything. Midi, audio,cells,layers... doesn't matter. It's the garbage icon in the edit menu. You double tap to delete. It only deletes one item at a time though. No, the clips in the Session view. When you long press a clip you get the Clip Settings popup where you can set the clip name, color, program change, # of loops and active measures. At the bottom you can Import and Export Clips and Export MIDI. This allows you to move a clip to a different song - except it doesn't work right. Exported clips (or maybe it's the import process) loses all CC data. And in the palette of clips that opens when you select Import, there's no way to delete a clip. You have to fire up iFunBox and do it that way, or else live with an ever-expanding list. Exported MIDI does have the CC data, but when it's imported it's no longer smooth curves, but stepped. And the Clip setting of active measures is lost, you have all 16 measures turned on. Use the delete tool. It can delete clips in the session view too. It deletes everything. As you can see I deleted clips with no issue. It's the repository of Exported clips and the palette from where you Import clips. You can't access the Delete tool from it. You can't swipe left or right. You can't long press. etc. Also, if you drag the clips to the right column, the name gets mangled. As noted, it's not just that you can't delete them, but that they lose their CC modulations as well. To move cells use the pen tool. To move an entire track also use the pen tool. Just drag Till you see the white before or after the cell you want to drag the selected cell to. Copy tool works in a similar way. 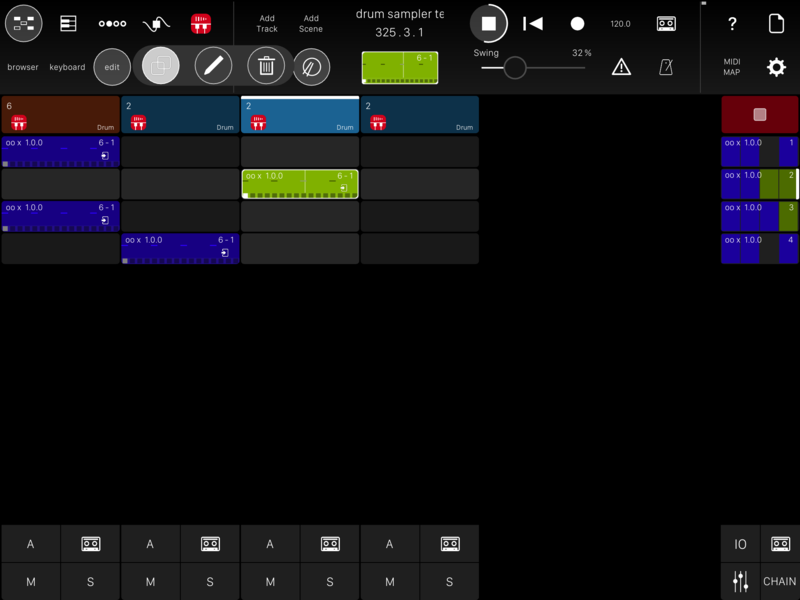 You can even copy an entire track with all its midi clips and loaded instrument. As you can see the edit tools are pretty powerful. Hope this helps. Oh wow. I never even used that functionality so didn't even realise it was a thing. You're right. Pm the devs @Nerk_ and @cblomert . They might be able to help you fix this. I doubt it was intentional. Just something that slipped by most testers. Who knows. They might pop up in the thread since I invoked their names! 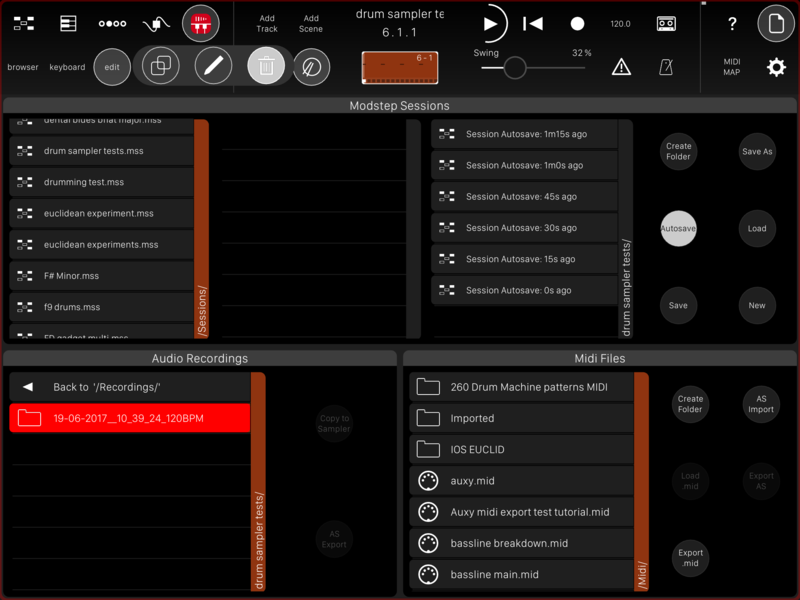 A workaround for the issue is to use AudioShare to export and reimport the midi. It's mainly what I use to move midi between projects and even daws. Although I'll be honest I don't think the cc modulation will be preserved. I mostly keep cc modulation seperte from midi anyways since I automate things in AUM and somI times have the midi and the cc running at different speeds in modstep. As shown in my template tutorial. The way I use modstep and iOS in general is as a sketch pad when I'm out and about. 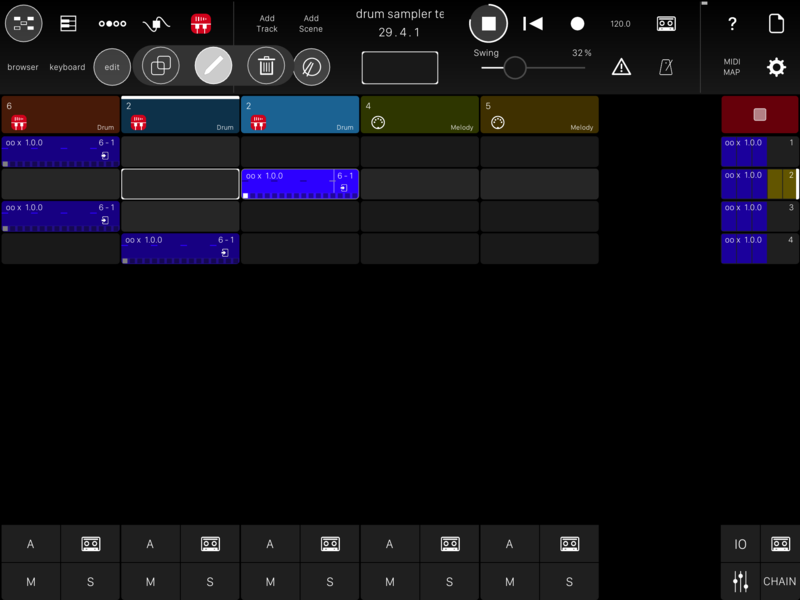 When I get back to my studio I hook up my iPad to my Ica 4+ And thanks to link all the midi is perfectly in time in Ableton. 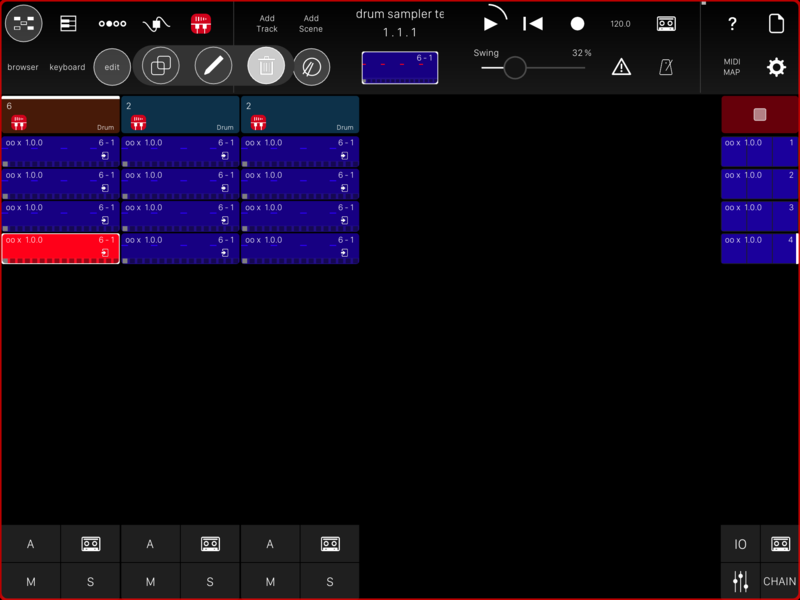 I have 16 channels of midi and audio input that I record directly into Abletons arrangement view in realtime. After that I mostly edit inside Ableton itself. With all my cc etc intact. First a clip is exported. Exporting the clip as MIDI data will save the CC info, but when that clip is loaded into a new track it's messed up. Smooth curves are turned into steps. The two point slope is turned into a three point step and the sine curve is now a stepped sine curve. Finally, there doesn't seem to be a way to delete the clip from the Clip Import window. As best as I can tell, you have to resort to iFunbox to remove unwanted clips. We've just changed the behavior of the edit menu - if you activate it prior to importing a clip/track, it will be put on top of the popups and be accessible while you open the import-browser. As to the CCs not transferring: we can't reproduce this problem here. 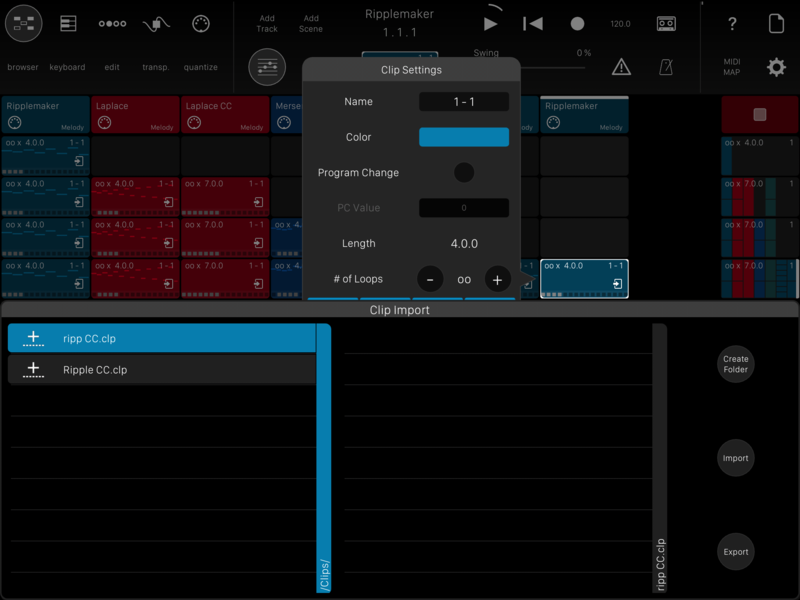 Try and export a clip and import it on the same track (to make sure they have the same CC setup and activated) - the modulation should be there - it might just need a quick refresh by tapping on the CC in question. @cblomert any estimate on the AB3 update release? beta should be up tonight and as we haven't changed much it should be quick to test! excellent. glad to hear it and thanks for the quick reply! Thanks for the update. Looking forward to the new Edit menu (and anything else coming...)! Hmmm. Did you take a look at the video I posted? I just tried doing as you said (exporting and then re-importing on same track) and I have the same issue. The CCs are just not there in the re-imported clip. I tried re-toggling the CC, but there's nothing there. I did this on a track that I loaded a created template, so it wasn't just an issue with the temporary, generic CC labels (but it happens there too, as seen in the video). Also, the Export MIDI issue is also consistent - MIDI exported and the loaded in comes in as stepped, rather than smooth curves. You can see in both the Sine-like curve and the two point slope I create in the video. The come back as stepped, rather than smooth curves. I tried loading that exported MIDI into Auria Pro as well as Logic and the MIDI also comes in stepped, so it seems to be on the export. I tried the other way around, exporting from Logic and it loads correctly into Auria and ModStep. So happy that development is continuing on this app! It's truly fantastic and the centerpiece of everything I do on my iPad. I'm happy to report that with the latest update the Edit menu is now visible when you're in the Clip import window, so you can now delete clips there. However, I still have the issue of exported clips, when re-imported, not keeping their CC modulations. I've tried this on the same track where everything is assigned and it doesn't work. I've tried it with CC templates and with generic CC values. The control change info is just does not make it into the imported clip. As mentioned MIDI export and import semi-works. The CC values are there, but they are stepped: a 2 point slope gets turned into a 3 point step. A smooth "sine" wave turns into a stepped wave. According to @cblomert this issue can't be replicated - can any other ModStep users try this out and see if it works for them? Anybody beta testing Modstep have news of forthcoming bug fixes? I get complete radio silence from their support. Seems to me that they’ve dropped the ball on Modstep in order to concentrate on their dj app. Would love to be wrong. Still, this app has been buggy for a number of years now. What bugs are you having? I feel like it's this myth that Modstep will never outpace, forever dragging around its early bugginess (mostly due to hosting IAAs); same perception afflicts BM3. And it makes sense: Why learn a complex app if it's full of glitches? But as @gonekrazy3000 has pointed out exhaustively, it's a remarkably solid app. I too would prefer a great update to the incomprehensible DJ Soda app. But I'm willing to wait. I genuinely dunno what bugs still exist either. At least for my use cases it literally NEVER crashes anymore. I open it , click on a clip , crashes shut. Don’t know what to think.. Although I've tried to love Modstep I've not yet found an easy way to feed to different tracks the the same AUv3 unless I send the midi to AUM and host the AUv3's there. (ie. one pattern that controls the notes and another pattern for automation of the plug-in). In order for this to be possible the Plug-Ins and Tracks need to be separated. @ExAsperis99 @gonekrazy3000 (and anyone else) can you try to replicate the exported clip CC issue I show above? What iOS version are you running. Modstep is stable as a rock on my iPad Pro running 11.2.5. I’m curious as well. have had no issues like this since 10+ On my Air2.